The tenth edition of Systema Naturae (1758) was (and is) the most important, because Linnaeus first employed the binomial system of nomenclature in zoology. He classified organisms from broad grouping to narrow groupings: kingdom, class (including the first use of Mammalia), order, genus, and species (first use of Homo sapiens) based on significant figurative traits. Rules were developed that provided consistency. Thus similar organisms were grouped into a genus, and each organism was given a two-word Latin name. For example, the domestic dog is Canis familiaris. Canis is the genus name for the group of animals that includes dogs, wolves, coyotes, and jackals. The word familiaris acts as a descriptor to further differentiate the domestic dog from its wild cousins. 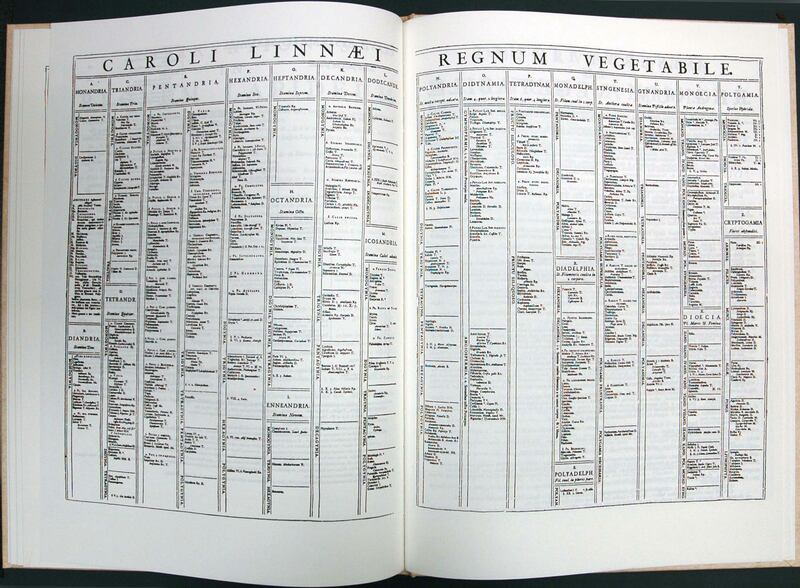 Linnaeus was ennobled in 1761 and took the name Carl von Linné, as shown in this English edition of 1806. Linnaeus was convinced that God had led him towards the study of botany. When he arrived in Holland in 1735, he had most of the manuscript of Systema Naturae, his attempt to document the working plan underlying Creation, ready for publication. With funding from the botanist Johann F. Gronovius and Isaac Lawson, a young Scottish doctor, the original fourteen folio sheets were finally printed in Leyden in December 1735, and sold for 2½ guilders each. 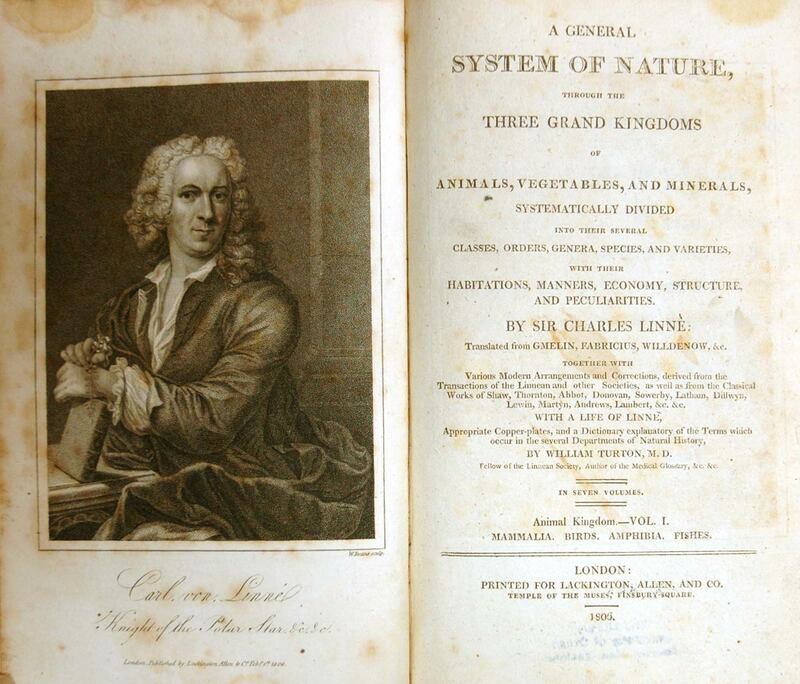 The importance of this work - 'the golden book of naturalists' - lies in the fact that Linnaeus classified the three kingdoms of nature and outlined the sexual system for the classification of plants. He established a hierarchical taxonomy (with logical rules) which is still in use today. This is a facsimile of the 1735 edition. Linnaeus was confident of his own importance. Of himself he said: he is 'the person who has brought science to its present completeness; has divided the class into its natural orders, genera and species, and shown sufficient characters; collected synonyms, and awakened a national taste for the science.' 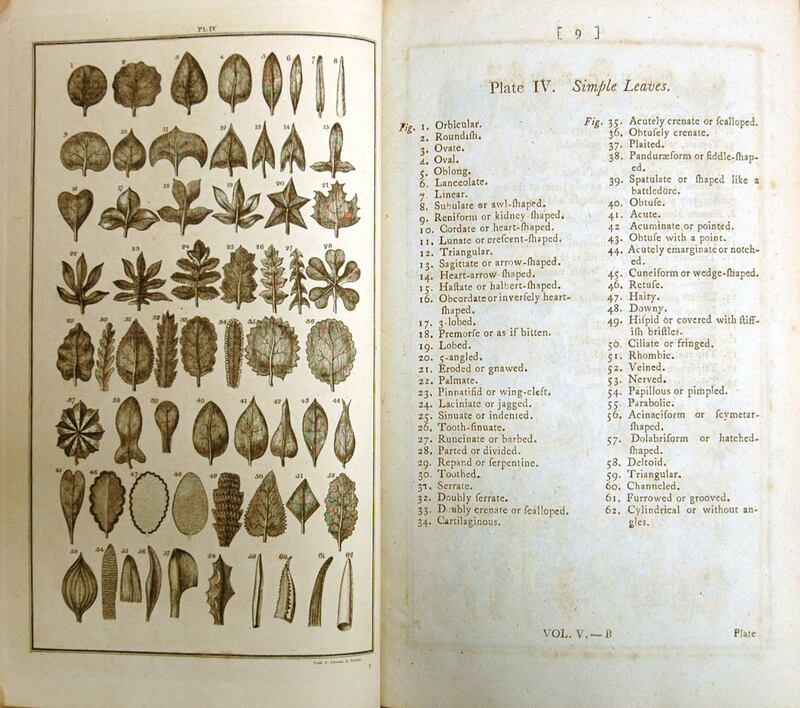 With completeness, and his developing system in mind, it was necessary for Linnaeus to examine numerous samples of almost everything to establish their place and position in his system. One sample that highlights the complexities of classification and description, as well as the enormous amount of time involved in finalizing decisions, is the simple leaf, of which 62 types are shown here. © Linnaeus, Special Collections, Library, University of Otago, New Zealand.